Write Events to Application Log – This writes all activities by ShutdownUnless to the Windows NT Application Event Log, and if a shutdown/restart was aborted, it lists the details on why. Email on… features – These options will naturally email you before these events occur, and if a shutdown/restart was aborted, it lists the details on why. 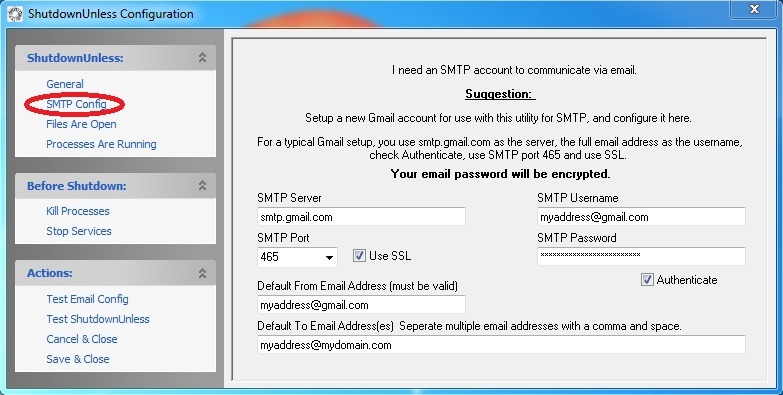 Naturally you MUST set up the SMTP config in the next section for this option to work. Append to Email Subject Line – You want to put a descriptive term here for each PC/Server you are using ShutdownUnless on, in order to easily identify it in the subject line of the emails you will receive. Files Are Open: Here is where you define a list of open files which ShutdownUnless checks for prior to performing a shutdown/restart operation. 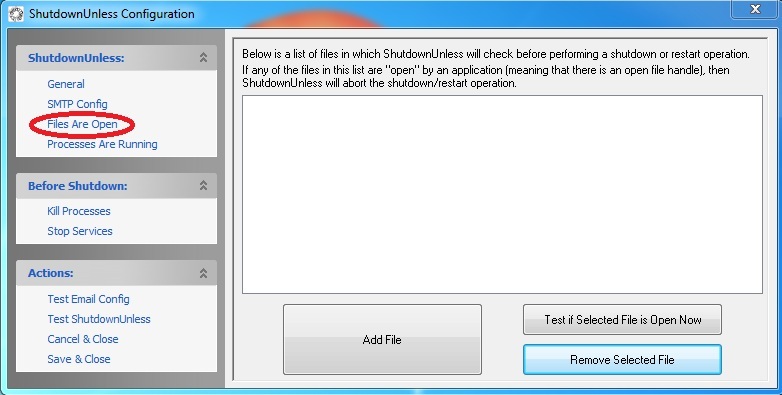 If any of the files are open by an application, ShutdownUnless will abort the shutdown/restart operation. This feature is useful for database files and such, where if a client application on the server or a connected workstation is currently accessing the file, it will be “open” and could cause corruption if the server were to shut down while the file is open. Processes Are Running: This is a list of processes that ShutdownUnless will check to see if they are running before a shutdown/restart operation. If any process in this list is currently running, ShutdownUnless will abort the shutdown/restart operation. 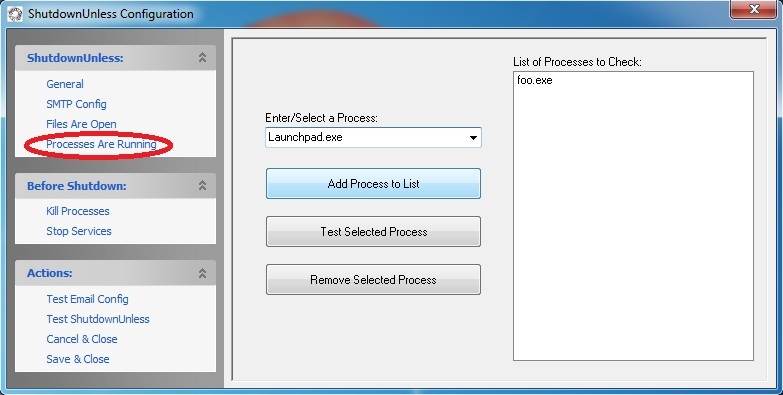 To add a process, type the name of the process or select a currently running process from the drop down box. To remove or test a process from the list, select it in the list and click the appropriate button. 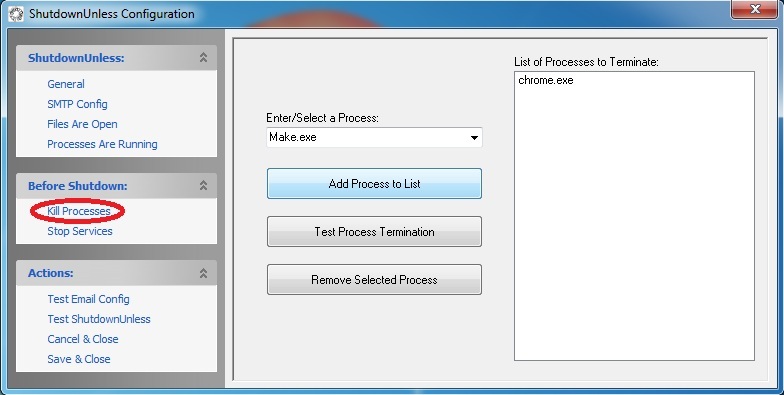 Kill Processes: Processes in this list are terminated prior to performing a shutdown/restart operation. This option is redundant if you have the Force Hung Apps to Close option checked on the General Config screen, but if you don’t want to check that option, this feature can be useful for processes you know will be stubborn and cause the shutdown/restart operation to hang indefinitely. Stop Services: Services in this list will be stopped prior to a shutdown/restart operation. 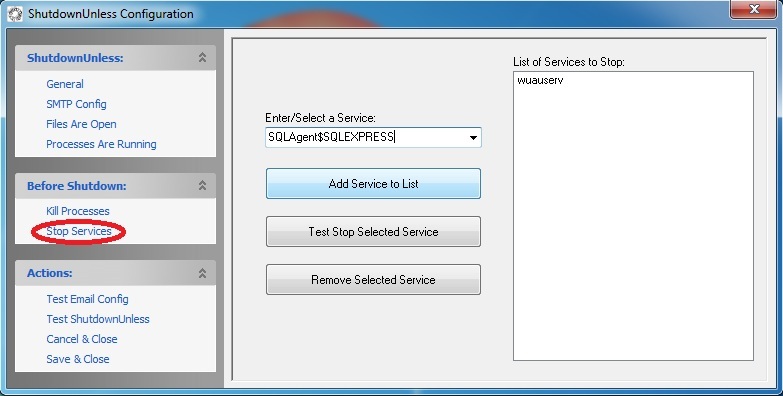 To add a service, simply type the service name or select it from the drop down list, and click the add button. 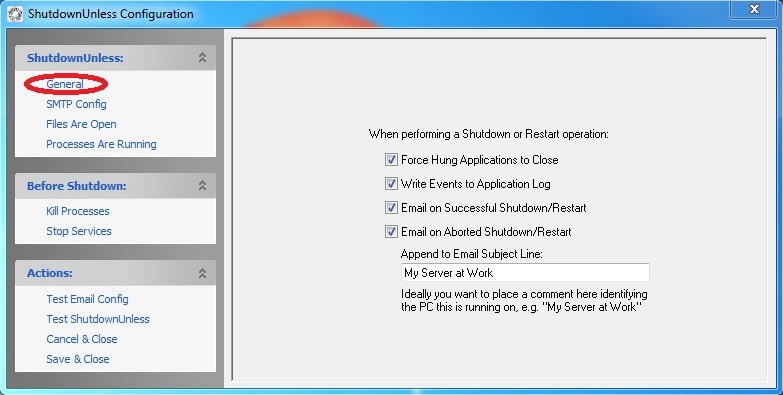 This option is particularly useful for services that hang during a shutdown/restart operation. Sys admins will know that for example that frequently Exchange 2003 will hang on a server shutdown/restart and delay it as much as 15-30 minutes (!!!) unless you stop the services prior to the shutdown/restart. There are other such pesky services in the IT world and if you come across them, this is the option for you!